Kevin Spacey is a pleasure to watch in anything. Ok maybe not in “Fred Claus” or…anyway you see where I’m going. Who doesn’t like Kevin Spacey? The Spacey appeal is what makes the otherwise forgettable “Father Of Invention” go down easy. 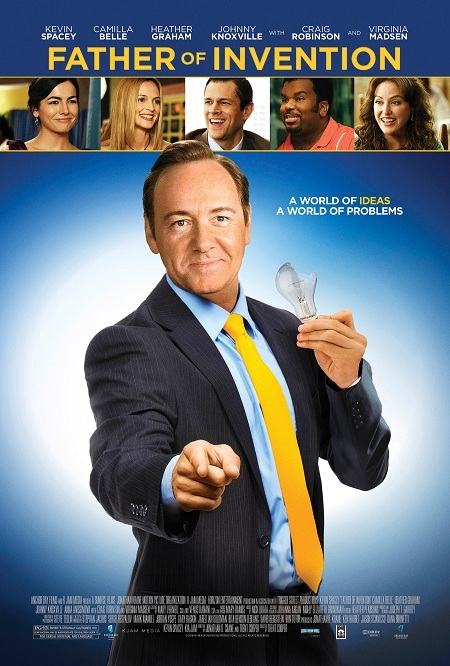 Spacey plays Robert Axel, one of those guys you see on T.V yelling about some product that will “Change your life forever!” Yet when the movie opens, we learn that Axel lost his company, lost his millions, and went to prison. Why? Because his latest product ended up maiming a lot of people. But now he’s back, and ready to get back on top. After getting out of prison, Robert returns home — or, at least, to the crowded home of his estranged daughter, who is now living with her friend and an angry lesbian (Heather Graham). That’s all you need to know here. Director Trent Cooper’s entirely predictable script provides Spacey with plenty of space to show off his goofy side. Sometimes it works, sometimes it doesn’t. But just like every other Hollywood comedy these days, predictability soon takes over, to a certain point where the film grows serious in its character development and even becomes sentimental. Boohoo. What saves it from completely going down the drain is the likability of its star. And because of that, I wouldn’t call “Father Of Invention” a complete waste of time. Just know it ain’t exactly hilarious. yi i love kevin spacey, a 2 bas?! yep this is pretty weak, eventhough Spacey is pretty funny in it.